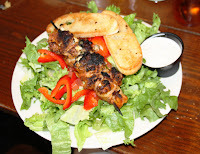 I’m sitting in the Gristmill River Restaurant and Bar in the Gruene Historic District enjoying skewered bacon-wrapped shrimp layered on a green salad. Larry and I have been visiting sites around New Braunfels (Gruene is officially part of New Braunfels) that families might enjoy on vacation this summer, and this was the perfect place to reflect on our findings over lunch. It’s hard to beat the Gristmill for delicious food, great views, and a friendly, casual ambience. Built from the remaining structure of a water-powered cotton gin that burned to the ground in 1922, the Gristmill has grown and expanded into a multi-level facility that can seat 950 people. Some days, especially on weekends, the tables are full. Indoor and outdoor bars provide relaxing places to wait, if necessary. In 1977 Pat Molak, who had also purchased and restored the aging Gruene Hall, began cooking and serving hamburgers and steaks from one corner of the former cotton gin. It was so successful that he added sprawling lower decks facing the Guadalupe River. Eventually the Turkey and Boar rooms, aptly named for the stuffed animals used as décor, were added and outfitted with stone fireplaces. The River Grove, an open air, brick patio overlooking the river, was added in 1998. The Boar Room is great for special events. 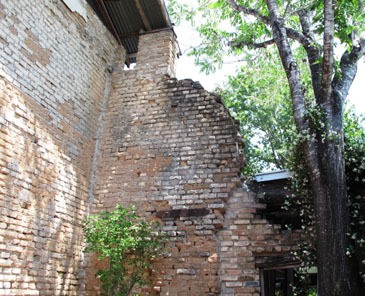 Located just 30 minutes from San Antonio by car and 45 minutes from Austin, the Gristmill was placed on the National Register ofHistoric Places in 1975. With its scenic location on a bluff overlooking the Guadalupe River, the restaurant is a destination for thousands of visitors (locals love it, too) each year. 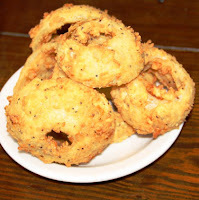 The menu still features Texas fare including chicken fried steak (Larry’s choice), fresh fish, and enormous sandwiches. Be sure to get an order of the thick, chunky onion rings (small size is plenty!) If you save room for dessert, the Jack Daniel’s Pecan Pie is a customer favorite. Hang around after dining to shop antique or specialty stores that line the streets of this historic German settlement, or listen to live music in Gruene Hall next door. Families and couples enjoy strolling around the town that time forgot. 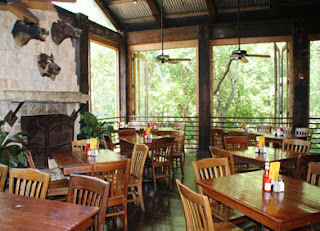 For me, the Gristmill has certainly contributed to Gruene’s reputation as a major tourist attraction in Texas.